When I made this documentary, it was definitely a celebration of my mother and her own journey but also a way for the viewer to experience and see how, through my art, my mother achieved her own accomplishments, her dream. By being my muse she’s become the person she’s always wanted to be. That was something that was revealed throughout the making of the film. Regardless of her own trials and tribulations, she was an individual that has succeed and overcome those things she wanted in her life without even knowing it through the art of her daughter, which to me is a very powerful thing. It’s like a celebration of her personal history, of womanhood, of motherhood, and I guess, just basically, the power of art itself. This past Saturday, I got to engage in those exact things—personal history, womanhood, motherhood, and the power of art—at a very special event. 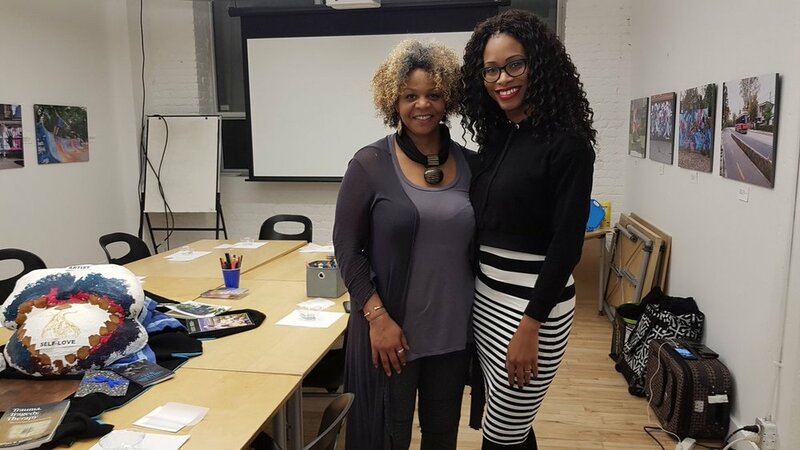 In the lead up to the Racialized Maternal Health Conference happening on January 31st, I was honoured to facilitate an Expressive Arts Therapy workshop for a group of Black mothers, led by the incomparable artist and expressive arts therapist Georgia Fullerton. Put on by Mommy Monitor and RMHC, the workshop was held to create a safe space for mothers—particularly Black mothers and other mothers of colour—to express their pregnancy, birth, motherhood, and Black womanhood experiences through art. Georgia led us through a series of activities using words, colouring, music, and clay work while engaging in open and authentic conversations about our experiences, and we all created some amazing works. There is healing in art—I know that I feel lighter when I write, or when I dance, or when I take some time to colour or paint with Little Magician and Little Bird. But this session, where we really delved into the work of expressive arts therapy, was a new level of artistic healing for me. From using “I am” statements and thinking of words that resonate powerfully to create beautiful marble pieces to feeling the clay between my fingers and allowing myself to just create what felt natural (all the while knowing that I could smush it all together and create something new) reinforced a lot about being definitive in life while also leaving room for the freedom of reinvention. And as mothers/women who wear so many hats and carry so many responsibilities and emotions, I think those things were vital for me and the group to engage with in an artistic way. The conversations we shared only added to the therapeutic effect. From talking about racist experiences with the healthcare system to the intentional ways we engage our children in their various Black communities to our own desires to connect with more Black women and more, it was really affirming to be in that room—and from my perspective, Georgia succeeded in her mission of creating a space where we felt safe and supported enough to share our stories. This was Mommy Monitor’s first Expressive Arts Therapy workshop, but it won’t be the last! Keep up with the organization via their website, IG, and Twitter to learn more about how they support parents, and to be the first to know about upcoming events! Also, be sure to keep up with Georgia Fullerton to see more of her art and stay up to date with her expressive arts therapy work. Mamas, have you engaged in something artistic today? It doesn’t matter if you can sing, if you have two left feet, or if you can barely draw a stick person—play a bit today, and see how it makes you feel!